President Jacob Zuma launched the African Mining Exploration and Finance Company (AEMFC), a subsidiary of the Central Energy Fund, as the nucleus of the state owned mining company in Ogies, Mpumalanga, on Saturday. But the National Union of Mineworkers (NUM) hasvoiced “concerns” about not being invited to the launch. “The NUM is seriously concerned that as an organisation that represents the majority of mineworkers in South Africa, thus a serious stakeholder, has neither been invited nor notified,” spokesman Lesiba Seshoka said in a statement. Seshoka warned the Department of Mineral Resources to be careful in the manner it conducts itself “more especially in marginalising those who are at the coalface of wealth generation in favour of the bourgeoisie”. “The NUM wonders whether that mining company is going to be operated by goats or donkeys. Earlier, Zuma said at the launch and sod-turning ceremony that the ultimate goal was “to consolidate all state mining interests in one vehicle”. The AEMFC’s current portfolio included coal, uranium, and limestone, which constituted strategic mineral resources. 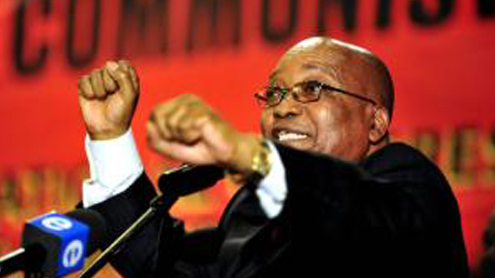 Zuma said government policy on minerals and mining did not make provision for the nationalisation of mining assets, but it did not prevent the state from participating actively in mining and competing with other companies. As a result, the state diamond mining company, Alexkor, has been operational throughout the transitional phase of introducing the new regulatory framework, he said. “Today, we are also happy to announce the first project of our mining company, the Vlakfontein coal mine project. About 90 percent of South Africa’s electricity is generated by coal, which makes it a key strategic energy resource.” Zuma said the Vlakfontein project fits the AEMFC’s strategy because it would assist in securing a strategic mineral like coal that will improve the security of energy supply. He said the mine was expected to supply Eskom power stations in the area while coal and mining was expected to take place for about 15 years. Zuma said Eskom currently burned approximately 115 million tons of coal per annum, and expected it to burn approximately 250 million tons per annum by 2018, depending on electricity demand. He said mining operations must benefit the host communities and therefore labour will be sourced mostly from within the Emalahleni local municipality areas.